Hi Dear AndroidTrickshub Lovers , Today I'm gonna show you a awesome tricks in which you can Reverse Tether Android your android Phone . There are many different situations where you might want to connect your laptop and mobile device to share Internet access. Most traditional tethering cases involve using a cell phone as a modem to get a laptop or tablet online, but sometimes you just might want to do the reverse – i.e. you might want to use your laptop’s data connection to enjoy Internet access on your Android phone or iPhone, tablet, or any other mobile device. This is called ‘Reverse Tethering’. You can accomplish this “reverse tether” from your Windows PC or Mac to your Android or iPhone device in a couple of ways. In short, Reverse tether means surfing on your phone using the ADSL of your PC. 1. Install connectify if you are configuring for the first time. 2. In SSID type the connection name you want to give. 3. Give password if you want to use a secured network. 5. Select the Wi-Fi network using which you will connect your Android Phone. a) “Open” if you do not wish to use any password. b) “WAP/WEP2? or any encryption from the available drop down. 7. Now switch on your Phone Wi-Fi. 9. Give the password when asked for on your phone. 10. You are done, now you will see an active or inactive client in the connectify. 2. Wi-Fi enabled Laptop or PC. 4. File in the attachment. Download Wpa_supplicant.zip and extract “wpa_supplicant” from it, and then save it on your SD card. Navigate to system /bin and copy wpa_supplicant and paste the file into any folder on your SD card. This will be used as a backup. Now navigate to the file you downloaded, copy it and paste it back to system -> bin. Note, you need to mount the system as R/W instead of R/O by pressing a button on the top just before pasting the file. 1. A rooted android phone. 3. Desktop files and apps needed for reverse tether. Start with Unpacking the zip file. This zip files holds the android APK, windows part and ADB. Ensure that you have root access AND SuperUser application installed. 1. 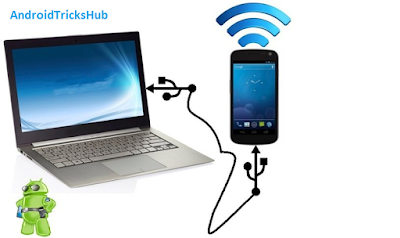 Connect your Android phone to your desktop via USB cable. Do not turn on USB storage. If you are using this program for the first time, this will install the latest android package and dependencies (busybox and redsocks). If you have Completed the whole process and did not get any error popping up, then congratulations! Reverse tethering is done and you should be able to use your PC connection on your android phone. If it doesn’t work then post the connection log with the error you are facing in our comments section. Keep visiting keep sharing ! Stay tuned with AndroidTricksHub to get more Tricks and Hacks ! Commen below if you need any further help ! SURE , STAY TUNED WITH US ! there are no files, why did u remove the file from link?